Dad has determined that since his job will be getting a little more hectic in the next few months, Kendall needs to start helping around the house. I have let her ride the gravy train for far too long. She is 17 months 18 days and 15+ hours at this point, it’s time to drop the children’s books! teddy bears, baby dolls, Elmo, and high chairs. It’s time she started to contribute to the chores around the house. So we started with a basic easy task. 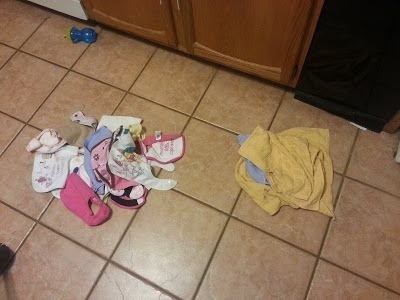 We separated some laundry and put them in piles. She watched me, had her typical serious look on her face and babbled her way through it. Now it was Big Sister Ks turn to put them in piles. She didn’t quite get it. She thought she was doing a great job. She smiled through the whole thing, repeated Dada 20 times or so and went on to her next task. Now it’s that time when we move onto putting the clothes into the washing machine. So dad pulled up a chair next to the washing machine and let Kendall climb up and watch. Once completed it was Kendalls turn. Watch how she did below. The end results are pretty obvious, Dad will not be getting much help from Kendall any time soon. I guess she is lucky she is so darn cute and I will let her have a few more weeks of being a kid. 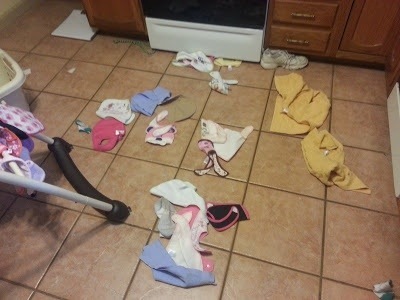 This entry was posted in Baby stuff and tagged baby does laundry, greeneville tn, Kendall DiMartino, laundry, stay at home dad. Bookmark the permalink.